After a span of 10 years, Kareena Kapoor and Akshay Kumar are all set to share screen space once again in Raj Mehta's Good News and the 51-year-old actor's #10YearChallenge post is all about that. 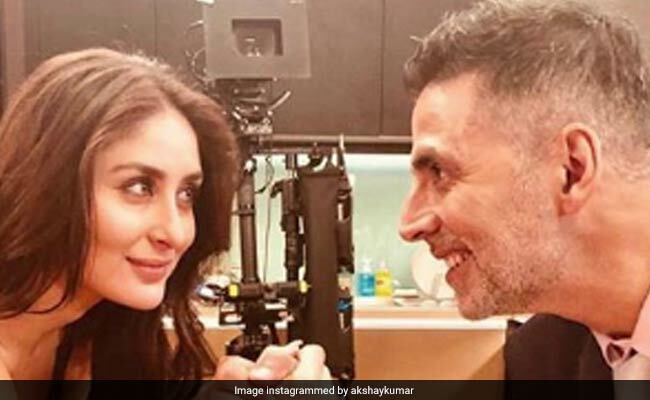 Akshay, who has started shooting for his forthcoming film with Kareena on Wednesday, shared a photo of himself and Kareena from their last film Kambakkht Ishq juxtaposed with a picture of themselves from the sets of Good News. Announcing the Good News on Instagram Akshay Kumar wrote: "2009 to 2019, the Good News is that not much has changed, or so we hope. First day of shoot it is, do send in your best wishes." In less than an hour, the photo has close to two lakh likes. Neha Dhupia, Sophie Choudry and Arjun Kapoor are some of the actors who have liked the post. Kareena and Akshay have previously worked together in films like Ajnabee, Aitraaz, Tashaan, Dosti and Bewafaa. Kareena had an extended cameo in in Akshay Kumar's 2015 release Gabbar Is Back. Celebrated make-up artist Mickey Contractor had also shared a photo featuring himself with Kareena and "her entourage" from the sets of Good News. Sharing the photo Mickey Contractor wrote: "Good News! The star and her entourage." Good News revolves around a Punjabi married couple trying to have a baby. Kiara Advani and Diljit Dosanjh, who are also part of the film, play a married couple. The film went on floors in November last year. Kiara and Diljit had shared photos and videos from their first day on the sets of the film on their respective social media accounts. Kiara had posted a boomerang video featuring Diljit Dosanjh and herself holding the film's clapboard. Produced by Karan Johar's Dharma Production, the film will hit the screens on September 6 this year. The film is set to clash with Anurag Basu's untitled dark comedy anthology which stars Abhishek Bachchan, Rajkummar Rao, Fatima Sana Shaikh, Aditya Roy Kapur, Sanya Malhotra and Pankaj Tripathi.